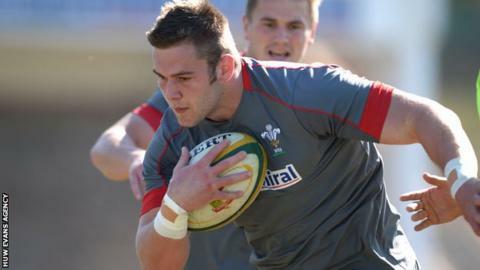 Wales flanker Dan Lydiate is set to join Ospreys, according to Newport Gwent Dragons chairman Martyn Hazell. Lydiate, 26, reached an agreement with Racing Metro in October to move back to Wales after the autumn internationals. The Welsh Rugby Union has offered the British and Irish Lion a dual contract. "I think Dan has made his mind up he wants to go to Ospreys," said Hazell, adding: "We're very disappointed he hasn't come back to us because he started his career at Newport." Dragons were also interested in signing Lydiate, who played for them between 2006 and 2013. Hazell said Dragons and Ospreys "offered the same sort of salary", but that Lydiate "wants a change". "His wife is from Swansea and they've got a house in Swansea, so I suppose that makes it easier to train and everything," said Hazell. "I don't think he's signed for the Ospreys yet, but I think he's going to. "We had a meeting and tried to convince him with his agent, but it was to no avail. We parted on amicable terms." The WRU and Ospreys declined to comment when asked by BBC Wales Sport. Lydiate, who has won 41 Wales caps, moved to French side Racing Metro in 2013, but left Paris after failing to hold down a first-team place. Hazell said Lydiate is "a very good number six", but added the flanker would face plenty of competition at Ospreys. "They've got a lot of back-row players, I don't know who they're going to play and drop. "They seem to be congregating a lot of back-row players. They've got Joe Bearman, who's injured at the moment, Justin Tipuric and different people." To date, only Cardiff Blues' Wales captain Sam Warburton has been confirmed on a dual contract, though Dragons coach Lyn Jones has said contracts are on offer to Taulupe Faletau, Hallam Amos and Tyler Morgan. The six-year Rugby Services Agreement said the costs of the contracts would be shared 60/40 between the WRU and regions, with the Wales team management having a say in the number of games the player would appear in while on regional duty.